Anderson Financial Solutions & Insurance Services is a specialized financial and insurance planning office located in beautiful Santa Barbara, California. Retirement Income Planning: As the generation of Baby Boomers approach their retirement years, they have many obstacles to overcome...overspending, credit abuse, overconfidence, procrastination, failure to save, failure to plan, and fear brought on by the recency of the financial meltdown. Our office is dedicated to helping those people and families come to grips with the reality and the responsibilities of today’s situation, to recognize the dangers, recognize the opportunities and capitalize on existing strengths and resources to create sustainable retirements with grace and dignity. Legacy Planning: Our clients have spent a lifetime accumulating and creating wealth - wealth that will sustain them for a long retirement characterized by security, dignity and grace. Our clients desire to create legacy plans that will benefit the generations and the institutions that will survive this lifetime. Our office is skilled in the knowledge and techniques of passing wealth beyond the generations with tax efficiency, order and clear direction. Employee Benefit Consulting: Small to Medium-sized businesses represents the backbone of American commerce and entrepreneurism. 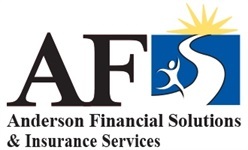 At Anderson Financial Solutions & Insurance Services, our creative and innovative, cost-cutting benefit designs help companies provide meaningful security to their valued employees in the area of medical, dental and other employee benefits as well as stimulating and incentivizing employees to save towards retirement in employer-sponsored retirement plans. Since early 2013 our firm is joined with The Arrow Benefits Group, a part of United Benefit Advisors (UBA) which is the third largest benefit consultancy in the USA. This collaboration provides our firm with the back office, the client support and resources to support and strategically manage rising costs and regulatory compliance, in a very challenging and complex employee benefits marketplace. Executive Compensation: Many organizations with highly-compensated executives find that the limitations of traditional pension and profit sharing plans just don't replace an adequate amount of a highly-compensated executive's income. We have expertise and specialized knowledge of non-qualified Supplemental Executive Retirement Plans and can help construct and administer the plans that can help attract, retain and reward those key executives. We invite qualified families and business owners to meet with us to discuss financial concerns. Let us design a custom solution utilizing the unique opportunities and resources available to bring financial confidence and clarity to future-oriented families and businesses. Call today (805) 569-7666 or e-mail [email protected] for a no cost, no obligation, "Get Acquainted" meeting, and begin your financial planning process now! This communication is strictly intended for individuals residing in the states of (AZ, CA, HI, NV, OR, WA) No offers may be made or accepted from any resident outside the specific state(s) referenced.